The current exhibition at the OCAD U Student Gallery, Escape to Camp CMYK, features work by current Interdisciplinary Master's in Art, Media and Design student Eli Schwanz and recent alumna of the Digital Futures graduate program, Katie Kotler. "Escape to Camp CMYK is an augmented campground, an experiential landscape that expels the stresses of everyday life, through the interplay of both the virtual and the physical. Entering through the campground’s trails, reveals an immersive space filled with hypnotic campfire, celestial light play, and an alien canopy. Exploring the campground divulges a performance that embodies the search for physical and mental serenity. Escape to Camp CMYK creates an experimental environment that is submerged in tranquility, by the use of everyday objects, light, and technology." "My Independent Study in Florence, Italy, began in the spring of 2016, with my research and studio production overseen by Professor Dr. Martha Ladly. The Independent Studio was a focus on how in both painting and sculpture, narratives and allegory come together through form and matter in the work of the Renaissance masters, such as Michelangelo, Donatello and Lorenzo Ghiberti. The visual study in Florence was fundamental to my studio practice as a sculptor, where I use a traditional hand modeling technique of clay and wax that are directly linked to the studio practice of many of the Italian Renaissance artists. In Florence, with the help of art resident historian Dr. Katharina Giraldi. I studied the anatomical techniques and compositional approaches used by artists in the representation of both human and animal. I gained an understanding of the symbolic imagery used to communicate cultural ideologies. My proposal was to digest the research through a series of miniature plasticine clay studies. The choice to model on a small scale gave me the ability to fluidly work through ideas both structurally and conceptually. My research in the IAMD program explores allegorical narrative through anthropomorphic animal sculptures. I am interested in how the physicality of matter through form and gestures bring characters to life. 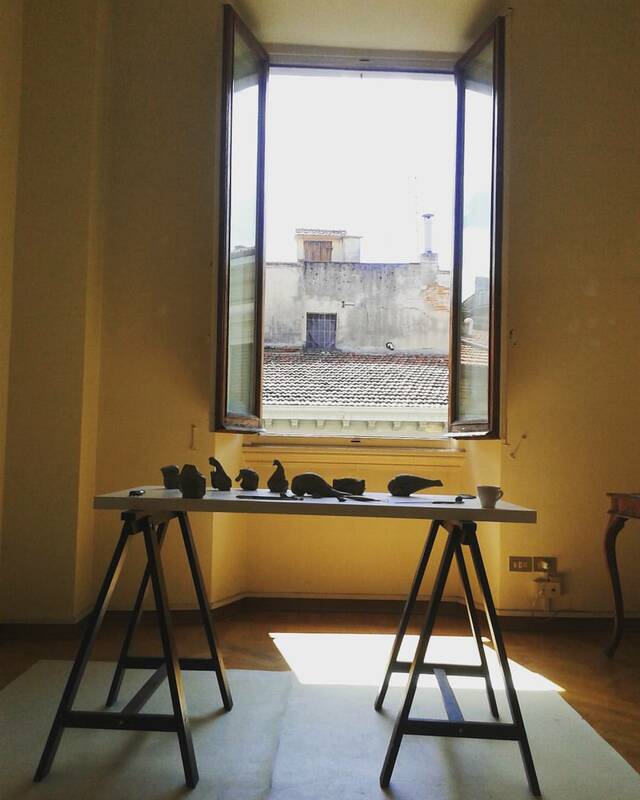 In Florence, I developed a series of bird sculptures at the moment of impact of having crashed into a wall. The work is ignited by the viewer’s imagination when my offerings of forms and gestures become characters, narratives, metaphors and allegories in the mind of the viewer. My research also involved traveling to, Pietrasanta, in order to visit contemporary artist Fernando Botero’s frescos (Heaven – Hell). I left Italy with an enormous amount of gratitude for having the privileged experience to further my research with the assistance of Professor Dr. Martha Ladly." The IAMD Colloquium was held on Wednesday, October 5 and hosted 15 presentations by IAMD thesis candidates. A warm congratulations goes out to all presenting students who delivered their exciting, inspiring, and bold ideas to faculty and student colleagues across programs and faculties. We look forward to seeing the resulting exhibitions and papers that arise out of their ongoing research! Image courtesy of Mariam Magsi. reVision is a juried group exhibition including work by Carlina Chen, a part-time student in the Interdisciplinary Master's in Art, Media and Design. After a summer-long renovation of the gallery’s new space on Queen St. and Abell, just south of the Drake Hotel, Propeller is re-opening this coming September-October, with an exhibition entitled “reVision.” reVision implies transformation, recalibration, redirection, and renovation. For this exhibition, Propeller asked artists to show Toronto’s creative communities their process in these terms. With over 40 works of art from painting to installation and video work, this exhibition features a complex array of interpretations and understandings of this theme. Information Session on IAMD Graduate Studies Program November 7 2008 10am. “I am a Banana Box” revisits OCAD Integrated Media thesis student Alexandra Hazisavvas’ 42 moves throughout her life. A large-scale performance installation done amongst the fleeting inhabitants of Souraren Park from April 11 to 13, Hazisavvas performs 42 moves in 42 hours. Each house constructed out of a simple wooden frame covered in unprimed Canvas. Placed in a grid formation the identical de-saturated white houses appear as ghostly structures. “I am a Banana Box” is a journey exploring identity, isolation and ephemeral spaces. In recovering her past, Alexandra Hazisavvas erects houses like haunting memories reliving each space without attachment. A graduating student at OCAD, Alexandra Hazisavvas started her career as a photographer, she has since shifted to performative video work and installation. Working primarily with questions of gender, identity and alienation, Alexandra’s work is striking and honest. “I am a Banana Box” has been curated by Kissing Cousin Collective and is Alexandra’s largest and most challenging work to date. On September 8, graduate students from the Interdisciplinary Master’s in Art, Media and Design and Criticism and Curatorial Practice programs joined artist Anique J. Jordan for a unique neighbourhood tour that highlighted the hidden history of a construction site close to OCAD University. The tour started behind City Hall on Chestnut Street where the new provincial courthouse building is planned for construction. Anique shared with the group that this site has a deep history that is obscured by the large, grey, hoarding that now traces the perimeter of the lot. Upon beginning construction, the development company discovered thousands of cultural artifacts from the site’s history as the location of a British Methodist Episcopal church, rooted in one of the most ethnically diverse areas of the city called The Ward. Originally built in 1845, the church was a crucial site for Toronto’s black community playing an important role as a spiritual, community, and cultural centre. Now the site is surrounded by imposing hoarding that demands to ‘post no bills’; it offers no narrative or suggestion of the site as one of historical civic significance. Anique is particularly interested in what she perceives as an erasure of the histories of the black and immigrant communities that previously thrived in that neighbourhood. With no signage, no commemoration, and no invitation for conversation, the current construction site illuminates a complicated relationship between historical preservation and the high-speed drive for new development in Toronto. From this former church site Anique led the tour group to the Art Gallery of Ontario’s exhibition The Idea of North, where works by contemporary artists are exhibited alongside paintings by the iconic Canadian artist Lawren Harris. Anique’s works in the exhibition speak directly to the history of the black community within The Ward that Harris also used as a subject in many of his early paintings. Her works, that directly reference the Chestnut Street site, create a contemporary history that speaks back to the historical narratives that are currently being built over, in an attempt to recreate a more accurate and honest conversation about the history of our city and its citizens. This artist tour was organized by Dr. Andrea Fatona, the Graduate Program Director for the Criticism and Curatorial Practice program. It was part of Graduate Studies Orientation week where all new students were welcomed to OCAD U - and its surrounding neighbourhood! I was recently lucky enough to attend the 2 Rooms Artist’s Residency in Duntara, Newfoundland for a two-week period in July 2016. Before leaving for Duntara I researched both the location and my area of investigation, however the actual experience reached far beyond my expectations. A three-hour drive from St John’s, the 2 Rooms Artist’s Residency, run by artist and OCADU faculty member Catherine Beaudette, is situated in a tiny town of about 40 houses on the north side of the Bonavista Penninsula. As a media artist, I was not sure exactly what my creative material might be. I was hoping to film medicinal botanicals however, the day I arrived an enormous glacier floated into the small bay and stayed. Perfect! I had an awesome subject and so set about recording its every shake, rattle and roll. And roll it did! Also melt, move, break and shudder. Because it was so close at hand, I was able to observe, film and photograph the iceberg in a variety of weather and lighting situations. My other area of investigation, medicinal botanicals, also proved to be rich in raw material. While I had brought books as research material, the proximity of so many natural medicinal plants inspired me to film, photograph and draw. As a bonus, with a drive to Gros Morne Park on the East Coast of the Island, I was also able to connect with a Mi'kmaq elder who took me on a fabulous, educational walking tour of medical plants in the region. My experience at the residency was vastly enhanced by the support offered by Beaudette. She assisted with both practical and theoretical challenges. A warm and welcoming powerhouse of a personality, Beaudette offered a welcoming dinner of freshly caught fish, took us for hikes, introduced us to locals, and generally advised on all manner of issues ranging from where to see whales, caribou and foxes to which plants were best suited to my research needs. The locals were super friendly and welcomed us into their little community. I took advantage of this by hiring a fisherman to take me out in a boat to film. The area abounds with the sights and sounds of nature, spectacular vistas, and an abundance of local talents in the form of small town bakeries, home made jams and preserves, and lovingly knitted crafts.